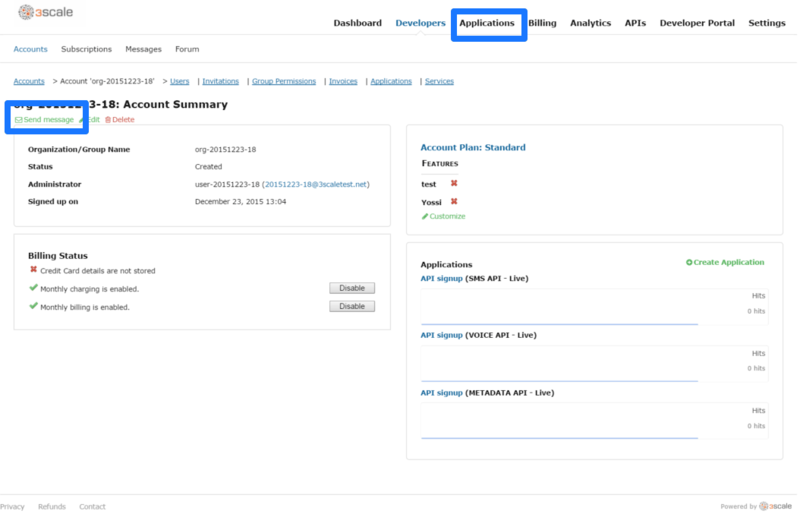 This guide documents business operations with Red Hat 3scale API Management 2.2. 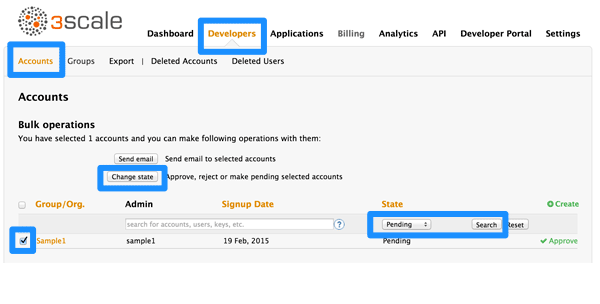 These are the steps to add a new developer account for access to your API. If you have configured the workflow to invite developers manually, this covers how to add new developers. On the Accounts page of your Admin Portal, create the new account. As an admin, you can skip even some of the required fields. If you want to invite users to the account securely, you can also skip the password fields. However the email on this main admin account must be unique among all users. 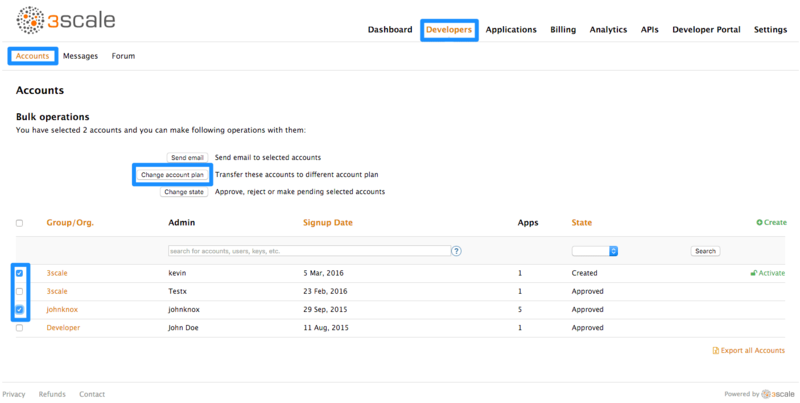 If you want to pre-configure app keys for the account, you can also add an application on behalf of the developer. Otherwise, leave this as one of the initial steps for the developer to take. You can either send an email invitation to the developer manually or follow the steps to use the invite developer feature. This section shows how to make approvals for any step in the signup workflow. Once you’ve implemented the signup workflow with manual approval steps, you have a few options. The approval process is slightly different depending on the trigger and what is being approved. If you receive an email notification, follow the instructions in the following section. Otherwise, it depends on whether you want to approve an account, a service, or an application. If you (as admin) receive an email notification that one of your developers has an item pending approval, you can copy/paste the URL for the item into your browser, and it will take you directly to the page to make the approval. From the Accounts page of your Admin Portal, you can search for specific accounts or filter all accounts that are in a “pending” (for approval) state. You can make individual approvals directly on each row, or select several rows at a time and perform a bulk approval. From the Service Subscriptions page, you can search for specific subscriptions to a service or filter all subscriptions that are in a “pending” (for approval) state. Then you can select one subscription or several at a time and perform a bulk approval. 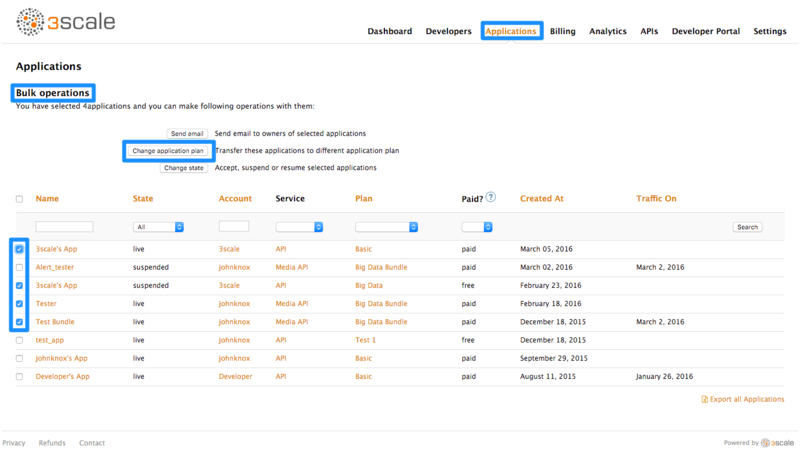 From the Applications page, you can search for applications or filter all applications that are in a “pending” (for approval) state. Then you can select one application or several at a time and perform a bulk approval. 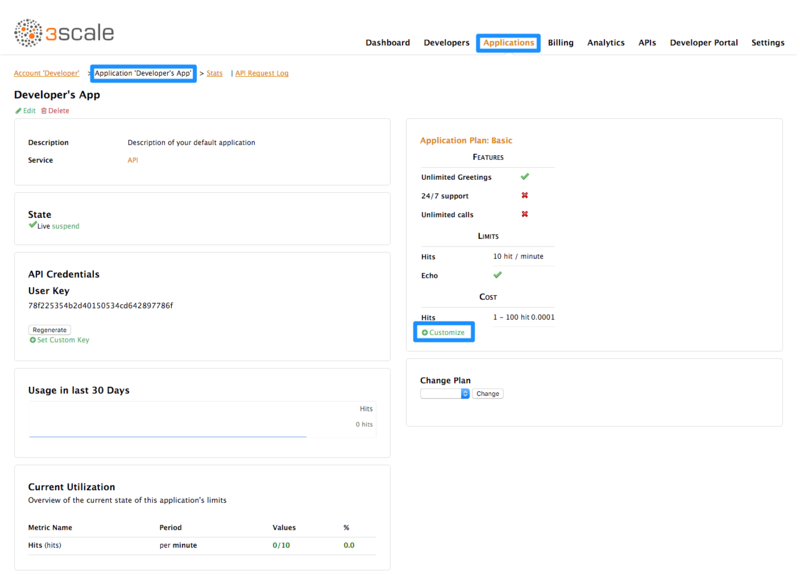 You can also start from the details page for a developer account, select which application you wish to approve from there, and make the approval on the application details page. As admin you may change plans for a developer at any time, or in response to a plan change request that the developer initiates. The change plans step is slightly different depending on what type of plans are being changed. From the Developers page, you can search or filter specific accounts. Then you can select one or more rows at a time, and change the plans. 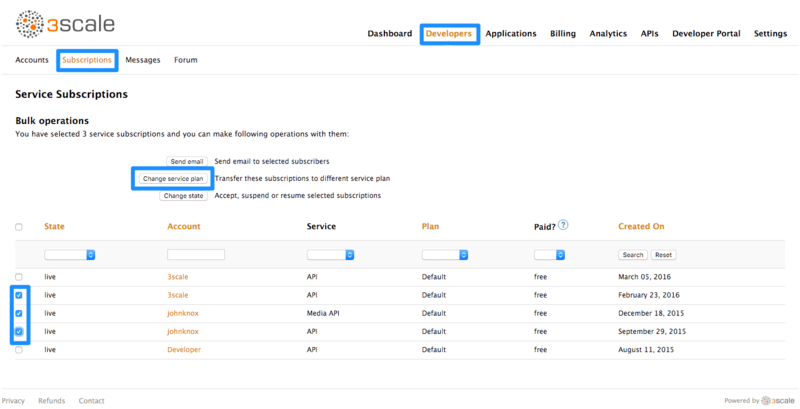 From the Service Subscriptions page, which you can only view if you have enabled service plans from the settings page, you can search or filter specific subscriptions to a service. Then you can select one or several subscriptions at a time, and change the plans. From the Applications page, you can search or filter specific applications. Then you can select one or several applications at a time, and change plans. Another scenario is to start from the details page for a developer Account. From there you select the application for which you wish to change plan. On the application details page, you can change the plan. If rather than change to another standard plan, you only want to make a change for one specific app, you can use the customize plans feature. This guide explains how to find out which developer account manages a particular application and then communicate with them – both through 3scale and externally. During API operations, you may urgently need to contact developers who are using your API. If you already know the account and developer who manages the application in question, you can navigate to their account from the Accounts tab as shown below. If you only have the application ID or API key, you can use the search box on the Accounts tab to find the relevant account. More information on locating applications is available here. Once you’re on the account profile page as shown below, click on the message icon. The message created here will be sent both to the account system dashboard, where all developers on the account will see it, and by email to the people on the developer account who have admin status within the account. Note that you can make contact phone numbers a required field upon signup. When you have completed this section you will have customized an application plan for a specific developer. 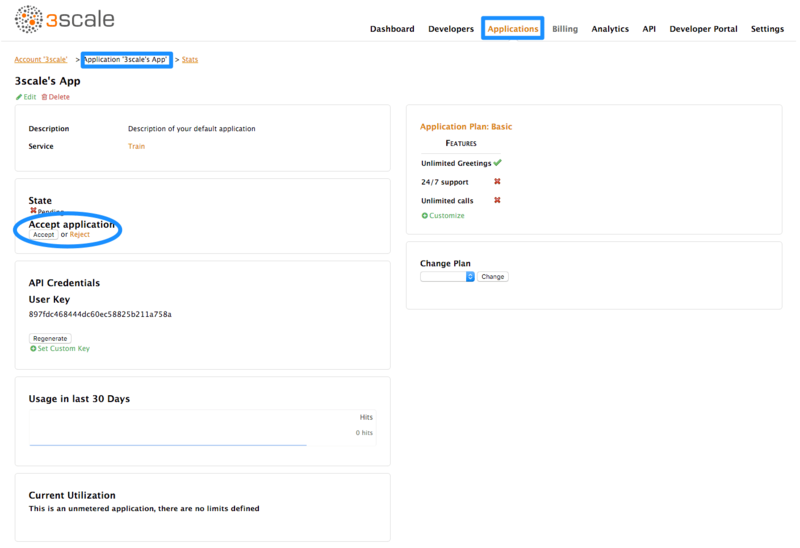 Application plans are a good way to apply standard policies for different segments of your developer community. However, you always have the flexibility to customize the standard plans for any individual developer with unique requirements. Once a plan is customized, you lose the link to the original plan. If you make changes to the original plan, the custom plan does not inherit any of those changes. So you should use this customization feature sparingly, before you become overwhelmed with too many custom plans which you cannot manage effectively. A developer wants to increase their current limits without upgrading to the next pricing tier as the current billing period is already under way. A customization could be a good way to handle this situation by enabling the increase in limits and charging only the variable costs incurred. This would also help encourage an upgrade for the following billing month. First you should view the details page for the developer Account you are interested in. Select the application whose plan you wish to customize. Select the option to “customize”. 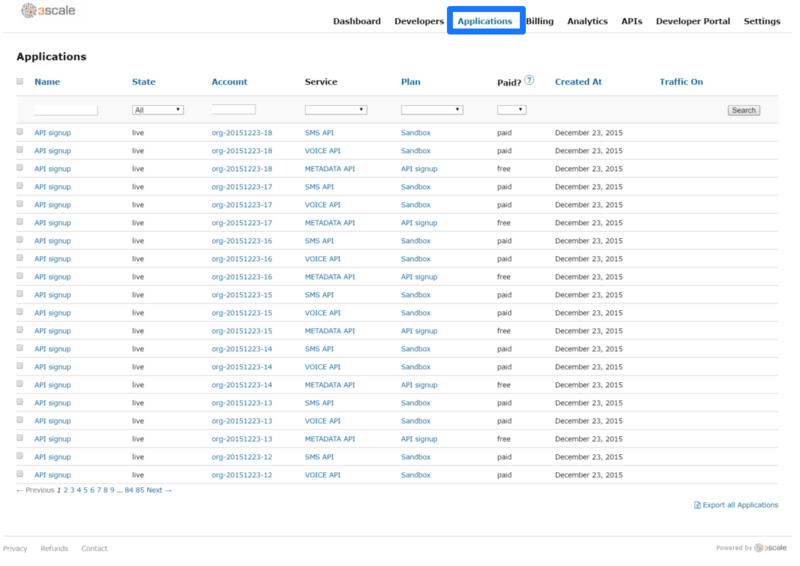 This provides the page where all the plan elements can be customized for the application owned by this account. Before you take the step to customize plans, always consider first if you are not better off with a new standard plan (which can be hidden from display in the Developer Portal). Then you would just change to the standard plan and so gain the benefit of reuse if this applies to more than one of your developer partners. 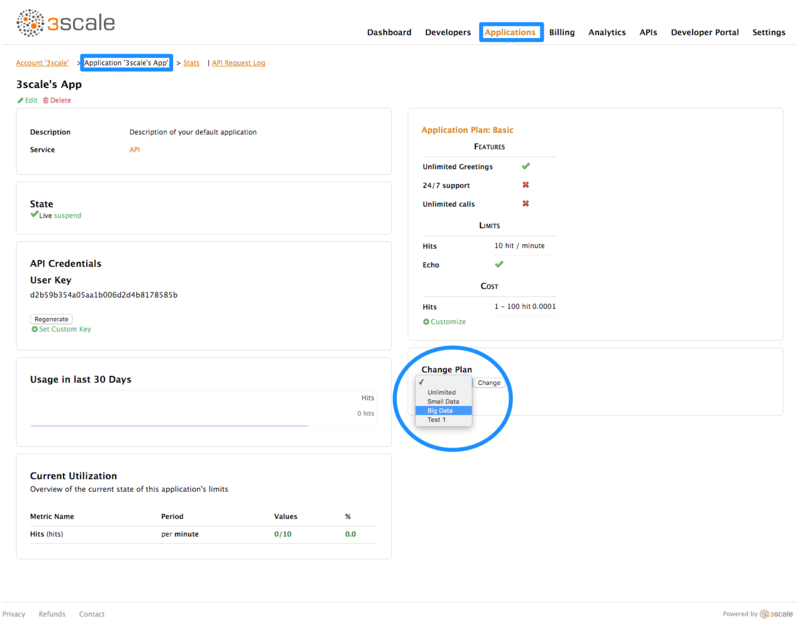 Configure developer signup by implementing self-service or manual mode. You can configure the workflow for developers to be self-service or by manual invite only. Self-service signups are done by developers through the Developer Portal, while manual invites are handled by your admins through the Admin Portal. All you have to do is change the checkbox toggle to signup enabled. After completing these steps, you will have added a new developer user to a developer account. When you create a developer account manually, you can invite developer users to that account through the Admin Portal. From Developers > Accounts page, select “invitations” and then “invite a user”. As an admin, you can unsubscribe developers from a service. You may need to do this for one specific developer, or for multiple developers, in the event of a service deprecation. This method only applies to services that have been deleted or suspended. You cannot perform a bulk unsubscription action on active services. This guide explains how to disable all keys and access tokens for an application. If an application is misusing your API and affecting other traffic, you may need to quickly suspend its operations before contacting the developer involved to ask them to amend their code or configuration. You can find the application from the Accounts or Applications tabs or by searching as described here. 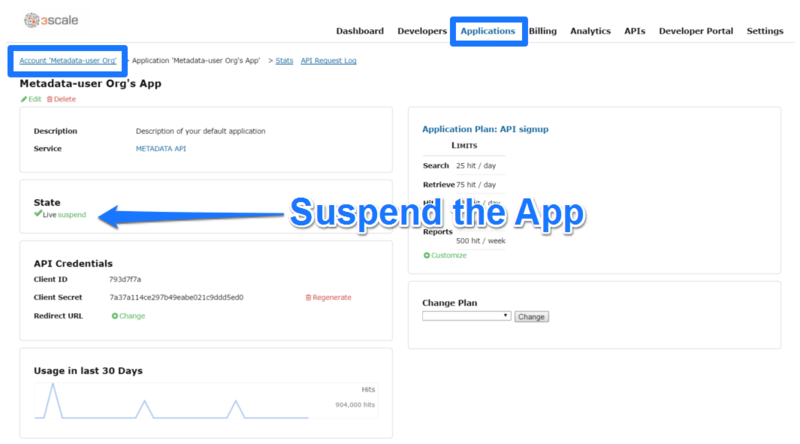 Once you have located the application and see the application summary page, click the suspend icon below the name of the application. This action will immediately disable the application from the API and suspend all keys from working. Calls with these application keys will be rejected by the control system. The application can be unsuspended using the same button once the problematic behavior has been rectified. If you use caching in your agents, suspension may not be immediate but require a short timeout. How you contact the developer of the application will depend on your workflow and policy. 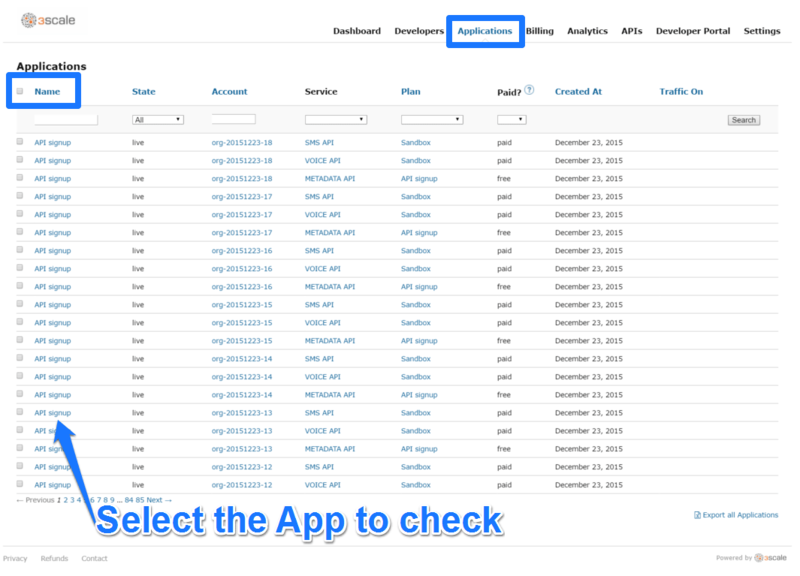 On the same page, you can click on the account name under the submenu, which will take you to the account view where you can identify the key administrator of the account that owns the application. 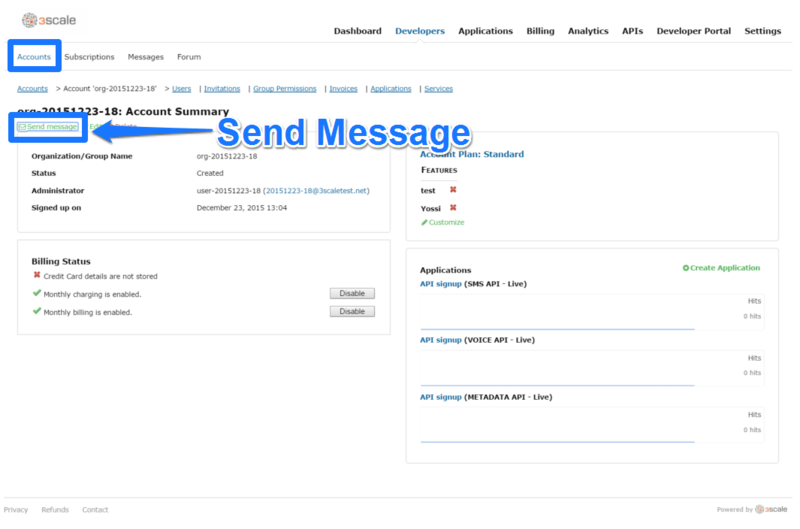 You can contact them either by email or by clicking on the send message button as shown, which will generate a dashboard message for the user. Red Hat 3scale allows multiple independent instances of 3scale tenants to exist on a single On-Premises deployment. A master administrator monitors and manages these tenants through a special master admin portal and API endpoints. Tenants operate independently from each other, and cannot share information between themselves. They are administered by tenant administrators, who can perform the standard administrative actions under their tenancy. For details on tenant administrator operations, refer to the Accounts guide. The master administrator has access to the master admin portal. Similar to the standard admin portal, the master admin portal contains information about all tenants in a deployment and allows for administration of tenants and users through a unique tenant page. Access the master admin portal using the master admin portal credentials and URL defined and output during the on-premises installation process. The master admin portal can be identified by the Master flag in the upper left corner. 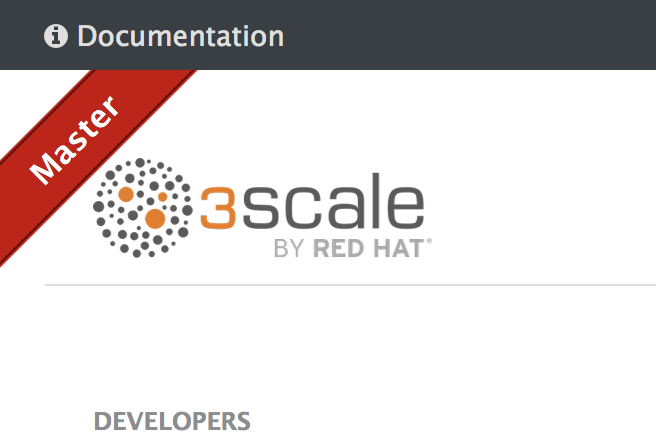 Once you select Create, Red Hat 3scale creates a tenant subdomain for your tenant based on the Organization/Group name. 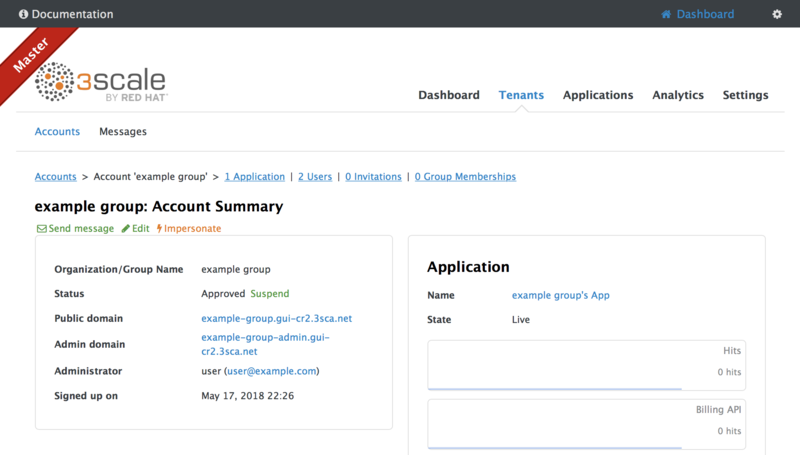 You can manage tenant accounts though master admin API calls. 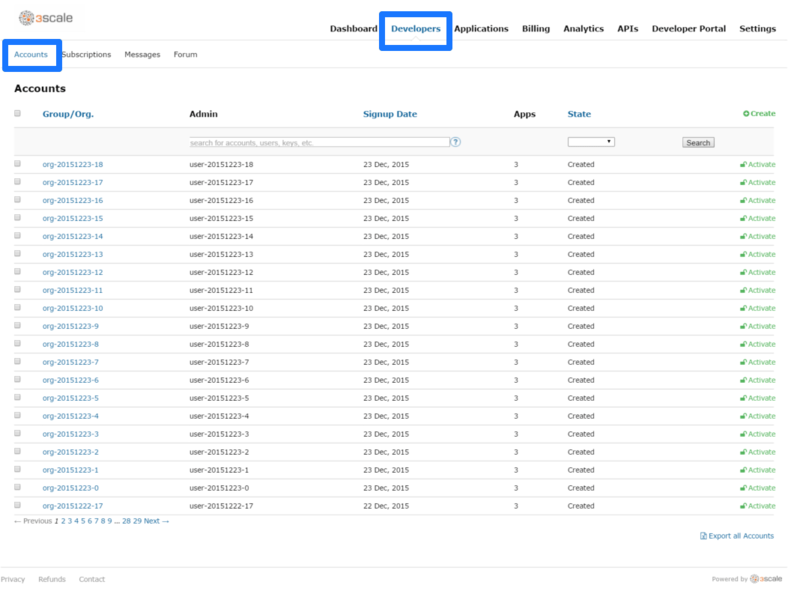 For information on master admin API calls, Refer to the Master API section of the 3scale API Docs, available in the upper left corner of the master admin portal. Additional tenants added by the master admin will be be assigned a subdomain based on their names. By the end of this section, you’ll be able to configure and take action on the webhooks for your Developer Portal. The use of webhooks allows you to tightly integrate 3scale with your back-office workflow. When specified events happen within the 3scale system, your applications will be notified with a webhook message, and you can use the data such as from a new account signup to populate your CRM system. A webhook is a custom HTTP callback triggered by an event. In the 3scale system, all the possible events are displayed as in the screenshot below. When one of these events occurs, the 3scale system makes an HTTP (or HTTPS) request to the URI configured in the webhooks section. On your end, you can configure the listener to invoke some desired behavior such as event tracking. 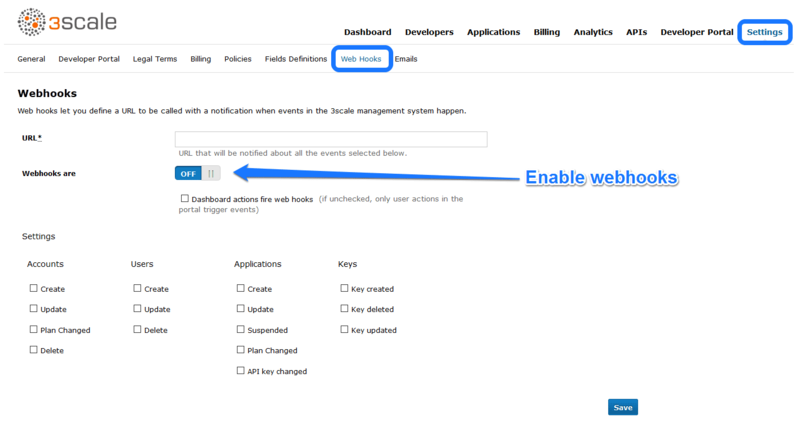 The remaining two checkboxes on the screenshot turn on webhooks ("Webhooks are" switch) and allow webhooks to be fired by actions in the Admin Portal. The default behavior is to trigger webhooks only by actions triggered from within the Developer Portal. Bear in mind that this means not all events can be triggered. The <type> gives you the subject of the event such as "application", "account", etc. The <action> – what has been done such as "updated", "created", "deleted". Finally the <object> is the XML object itself in the same format that is returned by the Account Management API. To check this, you can use our interactive ActiveDocs, available in your Admin Portal, under the Documentation → 3scale API Docs section. If you need to provide assurance that the webhook was fired by 3scale, expose an HTTPS webhook URL and add a custom parameter to your webhook declaration in 3scale. For example: https://your-webhook-endpoint?someSecretParameterName=someSecretParameterValue. Decide on the parameter name and value. Then, inside your webhook endpoint, check for the presence of this parameter value.